Vostok 2416B automatic (24 mm caliber). 31 ruby stone. Frequency: 19800 semi-oscillations per hour. Central Second hand. Average daily rate: –20+60 sec. Run-time reserve not less than 31 hours. Shock resistant balance. Water-resistant to 200 m. SuperLuminova hands and indexes. Stainle..
31 ruby stone. Frequency: 19800 semi-oscillations per hour. Central Second hand. Average daily rate: –20+60 sec. Run-time reserve not less than 31 hours. Shock resistant balance. Water-resistant to 200 m. SuperLuminova hands and indexes. Stainless steel case Leather strap Diameter..
Vostok 2415 automatic (24 mm caliber). 31 ruby stone. Frequency: 19800 semi-oscillations per hour. Average daily rate: –20+60 sec. Run-time reserve not less than 31 hours. Shock resistant balance. Water-resistant to 200 m. SuperLuminova hands and indexes. Stainless sreel case and brace..
Vostok 2415 automatic (24 mm caliber). 31 ruby stone. Frequency: 19800 semi-oscillations per hour. Central Second hand. Average daily rate: –20+60 sec. Run-time reserve not less than 31 hours. Shock resistant balance. Water-resistant to 200 m. SuperLuminova hands and indexes. Stainles..
Vostok 2416 automatic (24 mm caliber). 31 ruby stone. Frequency: 19800 semi-oscillations per hour. Average daily rate: –20+60 sec. Run-time reserve not less than 31 hours. Shock resistant balance. Water-resistant to 200 m. SuperLuminova hands and indexes. Stainless sreel case and brace..
Vostok 2432 automatic (24 mm caliber). 32 ruby stone. Frequency: 19800 semi-oscillations per hour. Central Second hand. Average daily rate: –20+60 sec. Run-time reserve not less than 31 hours. Shock resistant balance. Water-resistant to 200 m. SuperLuminova hands and indexes. Stainles..
32 ruby stone. Frequency: 19800 semi-oscillations per hour. Central Second hand. Average daily rate: –20+60 sec. Run-time reserve not less than 31 hours. Shock resistant balance. 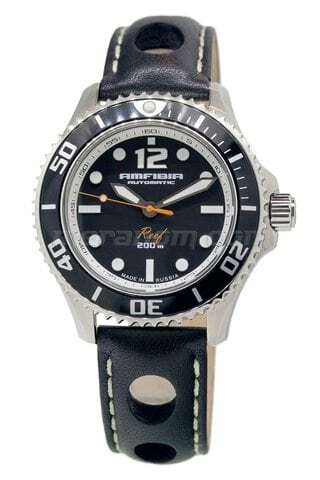 Water-resistant to 200 m. Stainless steel case and bracelet with PVD coating Diameter 42 mm, height 14,5 mm.. The first Russian Amfibia watches were manufactured in 1967 in the USSR on Vostok Watch-Maker Inc. Professional seamen, divers and submariners gave their preference to Amfibia because of their simplicity and reliability. Non-failure operation on depth up to 200 m in conditions of significant temperature drops, in any excited environment - mechanical watches Amfibia stood extreme overloads and impacts. Those were the requirements. Especially under the order of the Navy of the USSR was made the military modification of Amfibia, and tests of watches had passed during exercises of fleet by the Northern Sea. The submarine has laid on a bottom on depth of 120-130 meters, simulating failure. 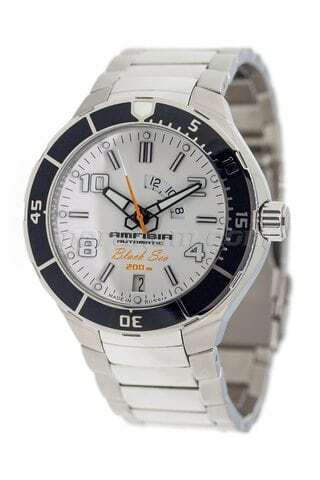 A brigade of the divers, who had taken part in rescue of people, was provided with new Amfibia watches while they were participating in rescue. Both, tests and exercises had passed successfully. In 1975 Amfibia watches had been in the space by the spaceship Soyuz-17 and to the station Salute-4. Amfibia watches were also tested by less exotic, but not less evident ways. They were run over the trucks, hammered, but they continued to show an exact time. Accuracy of work of Amfibia watches in many respects is obliged to the Vostok movements, and reliability to the shock-proof device of balance unit is a heart of mechanical watches. Organized in 1942 in Chistopol, Russia, Vostok Watch-Maker Inc. continues to follow traditions - all models of movements have so-called Swiss system escape descent, steel escape wheels and forks, a support on ruby stones, a watch hour spring made of special precision alloys. Having collected all world best experience of watch manufacture, Vostok Watch-Maker Inc. makes production which can be named by right the really Russian watches. The new collection of Amfibia watches consists of five models and is created for people who would prefer sport, like the active way of living and who can get pleasure from life. The cases support immersing on depth up to 200 m, the bracelets are made of stainless steel. The mineral glass - lens, luminous hands, hour sectoring of a dial and a starting point of rotating bezel provide exact and evident indication. 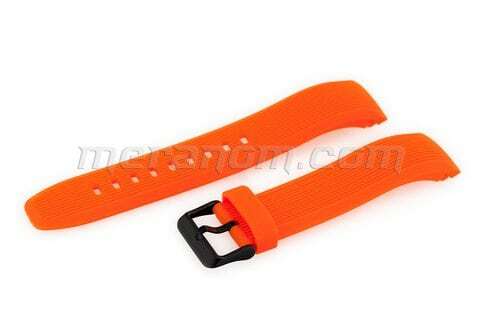 Hi-tech PU straps or natural leather straps smoothly and reliably bend around a wrist. The automatic movement 2416B of 24 caliber with a calendar of instant action passes the double control of assembly and tests. 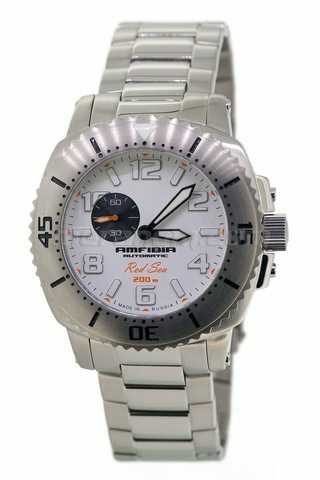 Amfibia «The Red Sea» watch - uncompromising male's watches in the big case (diameter of 44 mm, height of 14,5 mm) made of stainless steel. 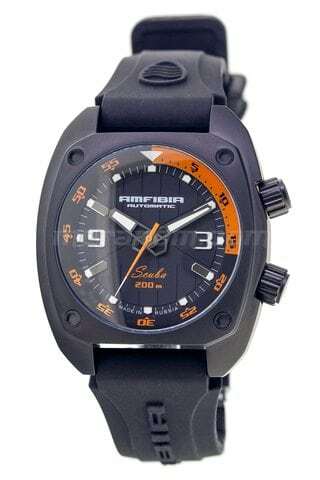 Amfibia «The Black Sea» watch - diameter of 45 mm, height of 14,8 mm. Bright, reminding summer, the sun, the sea and ideas on long-awaited holiday. 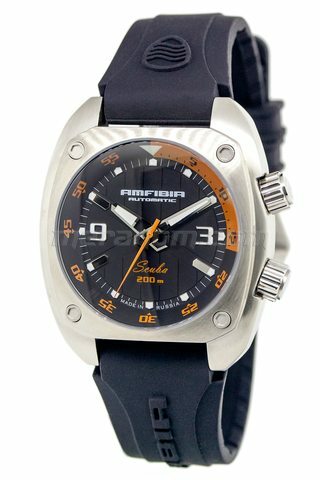 Amfibia «Scuba» watch - (in abbreviated form from Self-Contained Underwater Breathing Apparatus the respiratory device for navigation under water). Streamline, attention-getting watch with symmetrically located crowns. The winding crown is located on the right; the crown of adjusting internal bezel is on the left. The case diameter is of 41 mm, height of 12,5 mm. Amfibia «Scuba» is equally well looked both on right, and on the left hand as well. 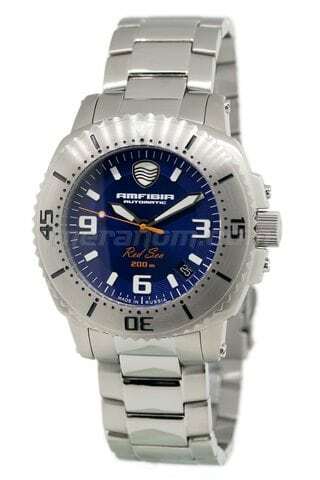 Amibia «Reef» watch - diameter is 42 mm, height is 14,5 mm. 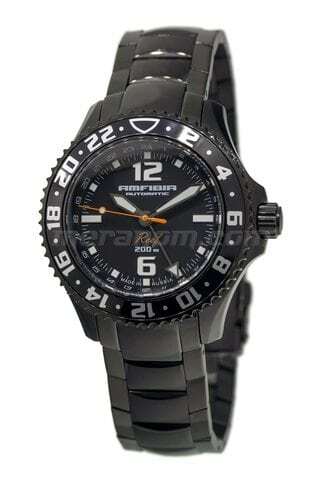 «Classical» sports watch for fans of active leisure will be equally pertinent both with business wear and sportswear. 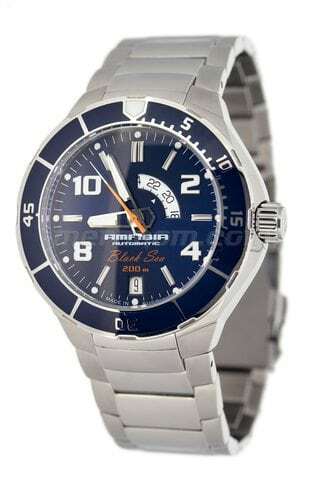 Amibia «Seaman» watch - 41 mm diameter, height is 14,3 mm. Stylish watch reminding a window, from which blows the spirit of voyages and new discoveries. 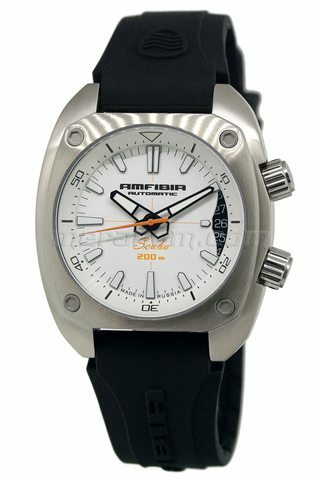 Also we are pleased to announce that the new four watches from Amfibia Collection called Turbina with 2416 and 2432 Vostok Automatic Movements will be on the sale in the mid of November 2012.